We’ve all heard it a million times, chronic stress is unhealthy -- weight gain, inflammation, low energy, illness, and countless more symptoms are attributed to staying in a constantly hyper aroused, high cortisol state. The ill effects of our overbooked lives are no secret -- the phrase chronic stress is thrown around so often, the meaning is almost gone! What do you think, feel or notice when the concept comes up - do you KNOW if you are chronically stressed? Do you feel able to do something about it? Do you know what stress feels like in your body? In your heart and mind? Does thinking about stress give you more stress? What about relaxation? Do you have a clear idea of what relaxation FEELS like in your body, heart and mind? Can you imagine or feel that sense of release that comes when you let go of tension? What is the quality of thought or emotion when you’re in a relaxed state? How do you interact with the people around you? What is your relationship to creativity and expression? Pause for a few moments to feel the difference in your body, heart and mind -- are you surprised to notice that some part of your body was holding or gripping under your conscious awareness? What do you notice about your ability to be present after finding some release? What do you notice about the quality of thought and emotion now? Decreasing stress levels doesn’t have to mean changing everything about your lifestyle -- it can be as simple as starting to notice the difference between stress and ease. Take a few seconds throughout the day to pause and notice where you’re holding tension in your body, to take a few deep breaths, and to let it all go. In those seconds, choose how you want to show up to your day - with presence, ease, kindness or whatever else. The more often you experience a state of relaxation, the more deeply it gets patterned into your neurology, the more easily you will be able to tap into that feeling, no matter what you’re doing or where you are. Of course, there are practices that can help cultivate that state -- regularly attending yoga classes, especially restorative and frequent massage can help make ease your default state. Join Leah Van Winkle RYT-500 on January 20th from 2-4 PM at Wild Ginger Studio + Lounge for a Restorative Thai Mini Yoga Retreat, where you’ll learn to the difference between stress and ease, and drop deeply into states of surrender. Leah Van Winkle is a Sarasota native, back for the winter from her home in Kentucky to share all that she has learned with the local yoga community! She has trained extensively in various styles of yoga at Kripalu Center in MA, The Om Place in Winchester, KY, and with teachers such as Doug Keller and Tom Myers, most of this training with a heavy focus on anatomy and the subtle details of alignment. Leah is also a professional Thai Bodyworker, trained with renowned teachers like Michael Sitzer, Noam Tyroler, and soon to train in the Soma Veda Lineage. 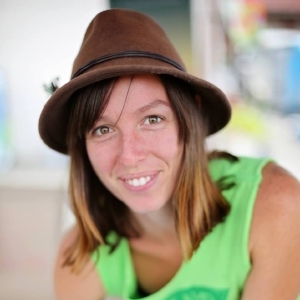 Besides yoga, Leah loves outdoor adventure, delicious, nourishing food (especially ferments! ), and learning as much as she can about whatever she can. Feel free to reach out with questions and clarifications about any of these offerings!